What: The China ID card, also referred to as the resident identity card, is a mandatory card that all Chinese citizens must possess and carry with them at all times. It includes information about the citizen’s date and place of birth, gender, and her or his 18-digit Citizen Identity Number. Why: Many components need to be validated to ensure that the company with which you are contemplating doing business is legitimate. A valid China ID card provides you with another component that can help you validate the company with which you are doing business. As we’ve discussed in previous articles, many documents, forms, and certificates comprise the dossier that is required to establish a relationship and do business with a Chinese company. In this article, we explain the details of the China ID card, also known as the Resident Identity Card, a mandatory card that all Chinese citizens must possess and carry with them at all times. The size of a regular credit card, the China ID card includes information about the citizen’s date and place of birth, gender, and her or his 18-digit Citizen Identity Number. Name (姓名): Chinese documents express the surname (last name) first. Most Chinese citizens have a single character surname. Ethnicity (民族): This information will indicate one of 56 Chinese-recognized ethnic groups. Han (汉) remains the most common ethnic group and represents more than 90% of the country’s population. Date of Birth (出生): Year (年), Month (月), and Day (日). Address (住址): Typically this address indicates the citizen’s place of birth rather than her/his current residence. Citizen Identity Number (公民身份号码) (See below for more information about the 18-digit Citizen Identity Number). 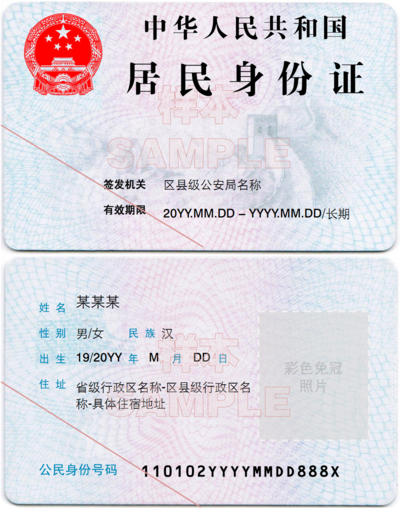 As discussed above, the China ID card contains an important piece of information: the Citizen Identity Number, an 18-digit national identification code that remains with the Chinese citizen for her/his entire life. The Citizen Identity Number follows a standardized pattern. Below we break down the components of that number. The address code on the China ID card refers to the Chinese administrative division where the person was born, usually a district or a county. The Citizen Identity Number breaks down as follows, with 2 digits for each component: province, city, district or county. More than 3,000 address codes are currently in use. (The Citizen Identity Number remains constant regardless if the citizen changes her or his household registration, or the hukou). This code represents the individual’s date of birth, expressed as the year, month, and date. Men receive an odd number and women receive an even number. This segment of the China ID Card indicates that the Citizen Identity Number is valid.